Sort six friendly squirters into their own color coded cut-outs in the fishbowl. Then spin to dump them out for squirt-time fun! Fishbowl floats or sticks on wall with suction cup. 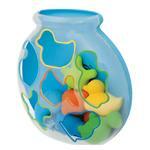 Includes 6 friendly squirters—easy to sort and squeeze!